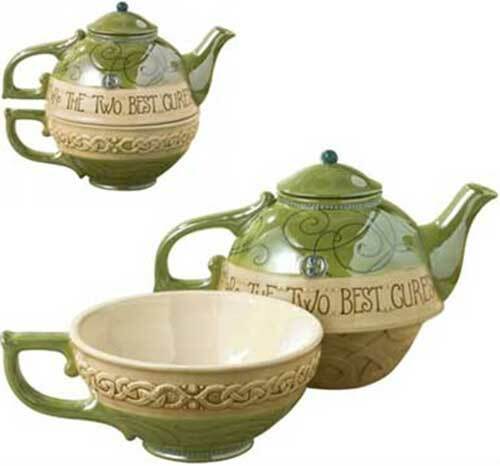 This Irish teapot and cup is a tea for one set that is enhanced with a blessing and Celtic knot-work. A good laugh and a cup of tea are the two best cures. This tea for one set features an Irish teapot that is enhanced with a blessing and Celtic knot-work along with an embossed Celtic knot-work cup. The Irish blessing teapot measures 7 1/2" wide x 6" tall (overall) and it holds 22 ounces; the Celtic cup stands 2 1/4" tall and holds 10 ounces. The stoneware teapot and cup is both microwave oven and dishwasher safe. This Irish tea for one is gift boxed a Celtic knot history card, complements of The Irish Gift House.